I am organizing an online creative business conference in May, and wanted to see if there might be a way for us to work together. We are looking for a few influencers to serve as advisers to the attendees. Advisers get a free pass to the event and advertising space in the conference guide. In exchange, we would provide you with an affiliate link to promote the event to your network. Let me know if this sounds like a good fit. Of course, I am happy to answer any question you might have. I got this very nice, professionally written request earlier this week. I turned it down. I don’t do affiliate marketing. I thought I’d explain how I came to this decision and why I feel really good about it. For an alternate view, you should read Elise’s explanation of why she embraces affiliate marketing and how she makes it work for her blog and her values. First, what is affiliate marketing? An affiliate marketing program is a way for businesses to make more money online by reaching a larger audience. The business signs a blogger up as an affiliate and asks the blogger to write about their product or service. In exchange the blogger is rewarded financially for each new customer they bring in. Being an affiliate is like working on commission. The more you hustle the more you make. In the case above, the conference costs $100 per person. As an affiliate I would earn $50 for each new customer who clicked over from my blog and signed up for the conference. My blog gets about 3,000-5,000 pageviews on an average day and many people come here for creative business-related content so there’s a good chance I’d have generated some sales through my affiliate link. Most people who do affiliate marketing (and that’s most people who have successful craft blogs right now) do it as a way to get paid for blogging. Writing a good blog is hard work. Writing a book review, for example, can take four or five hours. If you use an affiliate link you can at least feel as though you’ve made a few dollars for your efforts. And savvy craft bloggers only accept affiliate offers that are well-aligned with their content. The feeling is that if you would be recommending a product anyway why not become an affiliate and earn some money for it. When I look at those arguments, though, they’re not enough for me. The way I see it, you and I are on the same team. If I see a book that looks interesting, I’ll to buy it and make something from it, and tell you what I think about it without muddying the water with a sales pitch. When I write my newsletter I often include links to upcoming conferences or publishing opportunities or job openings in craft-related businesses. I recommend these things to you because I want you to succeed and to make the most of what’s out there. I’d like for you to trust my recommendations without reservation. And even if my blog doesn’t make money directly, it certainly makes money indirectly. My entire business hinges on this blog and every opportunity, every relationship, every sale happens because of it. Which is why the only business I’m an affiliate with is my own. I’m my own brand partner, and very happy to be that. I’ll gladly write a post about how you can make your email newsletter amazing and recommend my ebook about it. You can bet I’ll give you tips on how to sew a teddy bear for you baby’s first Christmas and link to my pattern for it. My sales pitch energy is focused right here on my own offerings. Let’s think for a minute about what I’d have gained and lost if I’d said yes to that affiliate marketing offer for the conference. Today’s post would have been about the conference’s great line-up of speakers and amazing resources. I’d have told you that it’s worth the tuition fee and sent you over to take a look, hoping you’d sign up so that I could get your $50 for a product I didn’t create. I would have disclosed my affiliate status and somewhere in the back of your mind you’d have noticed that my motivation might not be true. You might have wondered whose team I was really on. That post would have would have eroded your trust in my voice, at least in some small way. And once I said yes to doing it, I’d end up saying yes to more opportunities like it, even if it was just a few each year. Maybe you’d say, “Good for her! She’s making it work!” But at the same time you would know that I was recommending this conference over another one because I stood to get paid for it. I can’t have that be part of what I do. My voice is the most important thing to me. It is what I’ve worked on here, three posts a week for nearly a decade, and I don’t want to lend it to Amazon, or to a conference, or to anyone, even for $50 kickback. I find this really interesting, and I’m not sure there’s a single perfect answer that’s right for everyone. I can totally understand worrying that people will wonder if you’re suggesting a particular thing because you get a bit of a kickback. But at the same time, I wonder how you feel about someone using the amazon affiliate program when they’re linking to your their works. It seems pretty reasonable and expected that an author has an interest in having her own books sell (and is proud of her own books and comfortable recommending them), so it doesn’t feel like there’s quite the same potential conflict or lack of transparency. Does something like an author using an affiliate link to her own book on her own site feel different? Or is that still uncomfortable to you? And is it something you just elect not to do for yourself? Or does it bother you when other people do it as well? I’m perfectly fine with an author using an affiliate link for their own books, or for any book! 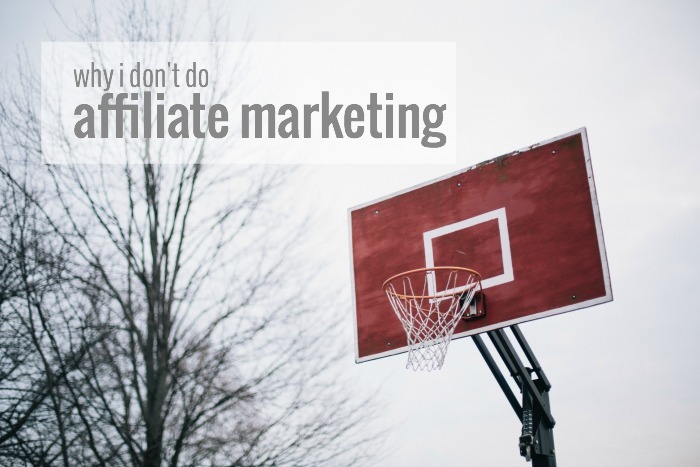 It doesn’t bother me when other bloggers use affiliate marketing to earn money. I spend hundreds of hours on my blog each month and I can truly understand the desire to monetize. It’s not the right choice for me, but it is definitely a good choice for many, many people. I agree – and maybe I am too cynical, but I don’t think so – I do feel that way about affiliate programmes, I have a lot of doubts about the products. In my case I wouldn’t click but I would sniff in a slightly derisory manner and move on. Integrity is important to me an it isn’t for sale. Interesting point raised by hunter about affiliate links to Amazon for own books, I think it goes back to what you said about supporting and marketing only your own work. Also Amazon cuts the price of merchandise, so you already get less on the deal than you would from other book sellers. So that wouldn’t bother me. Otherwise, I do tend to avoid those Amazon affiliate links too and get a bit annoyed by it sometimes. Some people work hard on their blogs, others let their blogs work hard for them. In simplistic terms I support the first kind, because really all blogs are sadly not equal. When an author’s book sells at a discount on Amazon the author still gets the same royalties they would have gotten if the book sold at full price. For years I did have an affiliate link for my two books, but I’ve since done away with those links. That’s interesting about the book royalty thing. I’ve heard authors complaining about the low price of their books on Amazon. (Actually there don’t seem to be many on craft books at the moment, for some months now). I have assumed that it was because they received less money. If they don’t, I wonder why it would matter? I’m glad to hear that the right amount of money is received actually, as I felt a bit guilty after I read that. I find your statement about royalties being the same interesting, because that has not been my experience. My royalties are a percentage of the price the publisher sold the book. In the case of Amazon, they tend to negotiate a price that is much lower than the “normal” distribution price. So although we are only talking “cents” (royalties per book are much smaller than most folks think), because the numbers aren’t large to start with, a few cents does make a difference. The argument would be that their distribution channel and volume makes up the difference and that could easily be true. But at least in my case, there is a difference. I had no idea, Gwen! Both of my book contracts have paid me royalties no matter what the book sells for. This is an important distinction that I was unaware of. Thank you! I love this. I’m in the running world rather than the crafting world, but the heart of this post still applies. I remember being frustrated when a blogger I followed was an “ambassador” for both a minimalist running sandal, and a really cushioned shoe. A post one week about the benefits of minimalist running was followed by a post two weeks later about these great, cushiony, light as air shoes. Huh? It’s hard to trust what he says, now. I don’t want bloggers to have to work for free, however I do think that many companies benefit more than the bloggers they work with in affiliate relationships, and it’s hard to trust bloggers who write a large number of sponsored reviews. You raise a very good point. To do well at affiliate marketing you often have to invest a good deal of time and energy creating posts with beautiful images, a great concept, and interesting writing. In conventional marketing this is work that a paid team would take on. I personally see the email pitch you got as a different scenario than linking a book you review… I would feel really strange inviting people to an event I hadn’t been to, even if it was making me money! I am pro-affiliate marketing and like it as an opportunity to “pay” a blogger for their work, if they’ve prompted me to buy a book or a pattern, etc. It does drive me nuts when bloggers routinely use affiliate links without disclosing them though – I don’t understand it, especially when I know they’re big enough to know better. That makes me avoid using their links, even if I do purchase, because it’s unethical (and illegal). This is such a tricky topic. I can so see your point Stephanie. Thanks for adding your ideas because it has really got me thinking. I often link to books, podcasts, and products I like and use, because I really believe in those products. They’re not affiliate links but just genuine recommendations that I’d like to share with my readers. But I almost feel like I need a disclaimer in there to explain why they are not affiliate links!. And I’m worried readers might question my integrity, even when I’m trying to do what I consider to be the right thing for me. It’s all about balance I guess. I don’t mind affiliate marketing but I do agree it can undermine trust and cause an audience to second guess your motives. I can’t stand it when products supported do not sync with the site or have never been used (or bought by the person themselves with their own hard-earned) to vouch their utility for the audience. But if it’s obviously something that’s right up in that blogger’s wheelhouse and they have bought it themselves and show you how they’ve put it through its paces then I don’t mind. In many cases I just don’t see the money received from the affiliate relationship being enough to take that risk. Sure, some are killing it, Pat Flynn for instance, but the majority of people are giving up oodles of goodwill in exchange for a few Amazon bucks. Not really worth it. That said, I also completely understand those who use it and I’m also happy to use the links to support my favourite bloggers. I have only one affiliate link on my blog (for a online entrepreneur education site) and I’m still not sure how I feel about that! I forgot to say that one type of affiliate link I don’t mind is where a blogger has negotiated a discount for their readers – so if they use their code the reader gets (say) 25% off a purchase and the blogger receives their affiliate reward. I kind of see that as the blogger working to get something for their readers and they are paid as a result. Getting a discount for your readers is a really nice thing to do. This is off topic, but people will often say that they’re doing a giveaway as a “way to give back to their readers.” When only one or two people have a chance of winning, I don’ t see that as giving back. I do see a discount code as a gift, though. That’s why I love reading your blog & getting your newsletter – you are honest, independent and ethical. No hidden agendas. It’s interesting that you used, as your first example, a program that you would actually be a part of, a contributor to!. I will very rarely become an affiliate for something (and only then if I paid for it and used it myself first! ), but I’m happy to participate in a conference or event and use an affiliate link as a form of getting paid for my contribution. I VERY rarely take teaching gigs that don’t pay (I can list 2 in 3 years), but if there’s some one or some organization that I’d love to work with, I might consider an affiliate partnership as a way of getting paid. (Again, just 2 over 3 years!). Instead of thinking of it as advertising or pitching someone else’s project, I look at it as sending fans of my work to another way to get some of my work. Thanks for sharing your thoughts on this, as I had never even placed “events I contribute to” in the same realm as “affiliate marketing”. I love that you make me think of things in new ways! So just to be clear I wouldn’t have considered myself to be a contributor to this online conference. Although the term was “adviser” what it really meant (and I clarified this with Andrea) is a free ticket and a free ad, both of which came with an expectation that I would then use my affiliate link to promote the conference. That was my total participation. Maybe it’s because I’ve had sites for years and have worked for ad networks that I have a very biased opinion on affiliate links. For me they erode no trust, though now thinking on it, it’s probably because I have such an intimate understanding of their value for both the publisher and advertiser and little perspective as the third party: the customer. I had affiliate sites before the FCC truth in advertising and looking back now they were a little shady, specific niche sites though I was learning a LOT about web development and SEO through those experiments. Those sites are gone now, for the better, but your opinion reminds me that it’s really important to remember that trust between readers/customers and a brand has more to do with the customer’s understanding of a brand’s actions and not the brand’s actions alone. You raise a really good point. For me, the customer (or blog/newsletter reader) is of primary importance. The community of craft online is really important to me, and I’d like to be a trusted participant and contributor. That’s a great explanation, and I appreciate your honesty. Is this also why you do not have your products set up to be sold by affiliates? Honestly I think that’s because I think managing an affiliate program would be time-consuming and I don’t have the time to devote to it! I landed at your blog after doing a deep search on Marie Forleo’s b-school. I was about to convince myself to do it and from reading online figured out it was mostly a big affiliate marketing scheme. I’ve looked at some of her affiliates who are very well-regarded and now they are tainted by what I know about b-school. I feel slimed-upon. I got your first newsletter to me this week and had so many tabs open on my browser I thought, “Wow, this is a really good newsletter.” Lo and behold you’ve written a book about it! Now that’s good marketing. I don’t know all that much about Marie Forleo’s b-school beyond watching the promo videos. Marie strikes me as a very savvy and ambitious person. I would have to see that materials and community to be able to make my own assessment about whether it’s worth the $3K price tag. From what I’ve read, the affiliates make $1k per person! That’s why it was so hard to find more objective reviews of the course. The first two google results are mostly affiliate’s blog posts misleadingly titled as reviews, or with titles like, “Don’t Go to BSchool,” subtitled, “Unless You Want to Make Tons of Money”. At that rate of pay, I think a lot of people set themselves up as business coaches just to be affiliates. The sample materials I received for signing up for the newsletter had me scratching my head. They were fill-in-the-blank .pdfs, just verbatim quotes from her videos. Some people online said the classes in school weren’t even videos, they were just slides. I wouldn’t know if these allegations were true without actually taking the class, but I truly feel like I dodged some deep disappointment! I own an online business, and I have been hit from the other direction as well. I frequently get emails from bloggers who ask, “Please send me fabric for me to sew/giveaway on my blog. It will be great exposure for you! ” I put in place a policy because of this and only contribute to select charities that can provide a 501(c)3 certificate. That’s an interesting perspective. I would love to do a post sometime interviewing online fabric shop owners about their experiences working with bloggers. What works best as a collaboration, and what really doesn’t. I am a new fabric shop owner trying to grow my business, and I’d be really interested in that kind of article, Abby. Thank you for this insite. A few of the bloggs I follow use this, but they are good at marking it. For one of them I just think of them as humorously written adds, while the rest of the content is the writers actual opinion. Other thurougly try out the product befor they review them, and add both positive and negative. These I trust. When it comes to recomending conferances and similar that you are actually participating in I would expect a blogger to promote it, regardless if they get money for it not, as they would be interested in having many people attending. Promoting a conferance that they are not actually participating in, or have attended before, I agree with you that it would feel false to promote it. Right on. In many ways doing affiliate marketing means writing clever ad copy for someone. If you love writing ad copy and creating visuals and stories that serve as advertising for another company, affiliate marketing is fun and fulfilling. I was an avid blogger before everyone had a blog. Then I stopped, for personal reasons. I re-entered blogging when I became a mom and a business owner and I was shocked and quite put off by all these affiliate and “sponsored” blogs and blog content. That wasn’t what blogging had been based on. It was meant to be personal journeying and connecting with others via the internet. It was for sharing craft, passion, yourself. But times have changed! I am a new follower to your blog and products, and I thoroughly enjoy your approach. I don’t feel pitched to. I feel like you are sharing information, and sure you incorporate your products and offerings- but you’ve managed how to do it well. Many could learn from you (including myself). Thank you for putting into words a vague discomfort I have had regarding affiliate marketing. I have recommended your blog and your products to many of my friends because I have complete trust in your knowledge and integrity. In my opinion your good name is one of your strongest assets in this field. I recognize that many creatives who are also bloggers use affiliate marketing to monetize their sites and that is fine for them, however, it no longer fine for me. A decade ago I thought that affiliate marketing would be a way to provide ‘residual income’. I also bought into using public domain art and ephemera to ‘create’ my own art to sell. It never felt good to me and undermined my own perception of myself as an artist. As an artist, maker and designer I have now been working for a long time to develop my own voice. I have purchased two of your ebooks directly from links on your site, and products directly from your store. I purchased Artful Bird years ago before I knew about your blog and who Abby Glassenberg is. (love it)I read your blog faithfully and have discovered many wonderful artist/makers from following links you have provided that I never would have known without While She Naps. In my opinion your recommendation carries weight. I appreciate your transparency. In this, as in all things, each one of us must do what is right for our own growth and peace of mind. I applaud you. First I want to say that as a newbie in crafting, I feel very respected by your sharing your thoughts. Of course as a consumer, I am well aware of affiliate marketing and it does raise a red flag and makes me very conscious about the ‘advice’ I am reading. I do agree that those bloggers use a product in their work on a regular basis have a different credibility, and these usually come with a very sound disclaimer. On the topic of blogging, I am utterly blown away by what it takes to keep it up – I have done a lot of writing and just that part, as much as I love it, is a very large task, and you have to do it over and over with real deadlines. But the behind the scenes part of creating the projects is by far and away astounding that you can even manage it – I am so impressed and very happy that you are there to do it. Stick with your gut – it becomes you! Thank you for this food for thought! I just started using some affiliate links to patterns of mine that were published in magazines and which I will not be able to self-publish for a while. I consider this is a service to my readers who are interested in these patterns but were not interested in the entire issues in which they were published. The other options of affiliate marketing hadn’t really occurred to me, so I appreciate knowing that such things happen and will be aware/wary of them going forward. This is really interesting, Abby. I feel like it depends on the premise of your own individual blog, too. Clearly you use your blog to promote and compliment your products and business, whereas others use a blog solely to make money by recommending affiliates. I always feel like, I’m working so hard to get people to my blog to begin with, (to promote my Etsy shop + art business), why would I want to send them away to someone else’s product? It’s about the long-term view–not a sprint, but a marathon of building loyal customers/readers–and that doesn’t happen when you’re bringing in a lot of other distractions. I agree with you. I think it’s important to send readers away only for a really good reason (an article you want them to read, for example). Before using an affiliate link in a post it’s a good idea to consider whether the money you might earn is worth the having that reader leave your site to make a purchase elsewhere. I simply adore you and your values! Thanks for being you and being totally transparent with us, your readers! Because of your honesty, I read your articles even when I am not interested in the subject. in my opinion, you are the greatest! Well, that was a very nice thing to read today. Thank you, Linda! Interesting timing! I dropped a blog I’d originally liked, just about half an hour ago, because it felt more like spam, than a blog. I’m not a blogger, but I do understand the need and desire for some form of monetary recompense for all those hours you work. Frankly, I don’t mind the occasional affiliate post, as long as it feels honest, as opposed to mercinary. That blog had reached the point of about 3 out of 5 posts being, essentially, a commercial. As consumers, we are hit every which way we turn with someone trying to sell us something. As I said, I get that bloggers need to make a living – not a problem. But, as funny and awesome as I know the superbowl commercials at halftime can be, I don’t tune in to watch them, if I’m not going to watch the game (which I rarely do). I promise, I have yet to read an ad, even from a professional ad company, that I wanted in my email inbox. I wondered about affiliate marketing, thanks for the info. I too would be interested in knowing how fabric stores like/dislike working with bloggers. I think that you have decided that “the truth” is really important and you are sticking to your truth. I like it that you do, and you are right it makes me trust you. Keep at it. This is the first time I’ve found another blogger that can resist affiliate links. You write your reason clearly. What a refreshing reading! Thanks. I’ll be back. Thanks for writing this. I am a blogger in the wellness/natural beauty space and I have come to the same conclusion. Many people feel that we just don’t “understand” how affiliate links work if we choose to not use them. However, I understand how they work. I simply choose not to use them because I feel that it compromises my control/independence on my site. I am so happy I found your site through a google search on this topic. It seems like affiliate marketing has taken over the blogging sphere! lol. Yes! I love this post! I always question why bloggers are promoting certain products now, is it the one that pays the highest commission? You just never know and therefore can’t fully trust them. It creates a system of so-called experts and ends up with disappointed customers when they find the product wasn’t as amazing as it was made out to be. It feels like the whole internet is propped up by this system, either convincing people to buy products because you’re paid to, or convincing people to become affiliates so you can sell them training on how to do it! (Not you personally!). As a stay-at-home mum, it’s very appealing and I’ve been researching it lately but something in me keeps saying it’s not right, especially when I am not exactly an expert at anything. So I just wanted to say how refreshing your post is to read (even though I may still go down that route if I can think of something I truly believe in that isn’t just another mum blog! )!